Work while we have the light. For the darkness grows around us. Work while we can share the light. men and women who shun the light. until they shut the doors of their hearts. million of infants batter heaven. leads us on and never deserts us. with us, but we said or did nothing. Anxiety and stress, one terrorist attack of any medium size and a financial downturn could set off persecution. The Irish classical scholar, E. R. Dodds wrote Pagan and Christian in an Age of Anxiety. Among many points he makes is one which should seem realistic to Catholics today. An agnostic, this scholar notes that in the unsettled economic times of the late 240s, the Church had grown and was beginning to be accepted in some circles as a force in society. But, alongside of that fact, was the hardening of ideas which in Dodd's opinion had been more fluid among the pagan and Christian intellectuals, of the doctrines and intellectuals in the Church. In other words, the pagan intellectuals were turning more and more against the Catholic intellectuals. For example, Porphyry wrote Against the Christians in 270. Dodd notes in his book that the growing wealth and confidence of the Christians, as well as there many scholars upset the status quo of the pagan elite and the pagan intellectuals. Does this sound familiar in the fact that so many of our universities in the West are increasingly anti-Catholic, atheistic and on the defensive against religion? That the establishment of intellectuals would then find support and give support to the political powers seems a natural alliance against Catholicism. And, Dodds quotes ancient authors in the fact that Catholics were not only "upstarts", a new religion, but "multicultural", that is "an immigrant religion", if I may use that phrase. How "un-Roman" could a religion which included converted barbarians be? That the intellectual snobbery and atheistic sophisticated pagans of the ancient world mirror our own is a comparison which is rather obvious. Ergo, the stage is further set for persecution, as the intelligentsia spurs on the state to eliminate the "undesirables" which threaten the so-called common good. Dodd himself writes that Christianity was seen as "divisive". And, the Catholic Church IS divisive, now more than ever. The fact that the Christian God is Incarnated and not merely a spirit is also a problem, but that may be discussed later. The stage is almost completely set up for persecution. The laws are in place, popular sentiment is growing against Catholics, and the common good will be an excuses for "unity". The next things to be put into place are already in place in America-the militarization of the police and the use of drones as well as the entire lack of privacy. But, how do the Catholics become singled out, rather than, for example, the Tea Party members, or Evangelical pro-lifers? And, how do the Catholics react as persecution starts in earnest, causing a smaller and smaller remnant? Moving from the established fact that totalitarian states guard the status quo by eliminating threats, and that such resulting persecutions are legal. one can state that such times of terror are actually popular with the vast majority of people. One thinks of the crowds at Tyburn who came to watch the death of "traitors". Remember, Diocletian's laws against the Catholics were seen as necessary for the "morality" of the Roman Empire. He had an ideology and he was an authoritarian. Does this sound familiar? He created his own popularity. He was seen as a "reformer" for the good of the people. Of course, he would make sure his ideas were popular. By definition, popularity is conformist. Catholics, by design, are non-conformists, a sign of contradiction in the world. So, too, were those in the time of Diocletian. Popular support of any type of persecution can be outlined. 1) Those who hate the Catholic would be relieved to join in such a persecution, and there are many who hate Catholics. 2) Catholics would be unpopular because their lifestyle makes people uncomfortable, reminding them of natural law and the Ten Commandments. 3) Popular support comes from a mind-set that "peace in our times" is more important than standing up for minorities or religious groups. 4) People thrive on the spoils of war from persecutions. My own family lost land and houses in the Holocaust, for example. Most of the existing aristocracy in Great Britain became wealthy land owners under Henry VIII and Elizabeth I from stolen land and resources taken from the monasteries, churches, and laity. 5) The unseen powers of the air, satan and his minions, hate the Church and use their slaves to bring down the Church. This is one of the goals of demonic activity. People involved in the occult and Masonry know this and cooperate with evil in popular movements. 6) Many people are just plain cowards or apathetic and will go along with the times. The stage is being set for the out and out persecution of the Catholic Church in the Western World. And, those who want a false peace, to placate their stained consciences, who hate God and His Church, and who live carpe diem, will go along with whatever a state decides. from Mosiacarum et Romanarum Legum Collatio 6.4, qtd. and tr. in Clarke, 649; Barnes,Constantine and Eusebius, 19–20. "the immortal gods themselves will favour and be at peace with the Roman name...if we have seen to it that all subject to our rule entirely lead a pious, religious, peaceable and chaste life in every respect"
Maximian, Galerius and Constantius, for the good of the empire. The financial and military good of the empire meant that the old gods of Olympus had to be appeased. In the face of difficult times, it was necessary for the citizens to worship the "true" gods of the empire. In a sense, Diocletian and his fellow emperors in the Tetrarchy were revitalizing the entire Roman world with a new sense of dedication to the old gods. The answer is obvious today. Any group of people which shows an allegiance to something other than the totalitarian heads of state form a threat. And, any group of people which holds beliefs contrary to those of the totalitarian state is a threat. The problem with too many Catholics today, is that they do not see themselves as a threat to the growing totalitarianism of both the EU and America, now both run by anti-Christian principles, and increasingly anti-Catholic values or ideals. Too many Catholics honestly believe that they can "talk" or have detente with the growing evil of the world. This prevailing attitude can only lead to an increase in self-deceit and a false hope for change. Small battles have been won here and there, but the battle for souls is being hindered by communism, socialism, secularism, and neo-paganism. It really does not matter, at this time, what "ism" will push through the draconian laws, as it only takes one. We have all seen this before under Henry VIII, Elizabeth I, and Mao, among others. The Catholics are the threat, always, as our kingdom is not of this world. So, the stage is being set, quickly, very quickly for a new February 24, 303. Well, God answers prayers quickly, I must say. I am going to highlight in the next few days what it means to be a remnant in a totally pagan and hostile world. In the 1970s, my spiritual leaders taught me that there was nothing neutral in the world-only that which was chosen and created for good, for Christ, and that which was chosen and created only for evil. Finally, more people are beginning to see this. I repeat, there is NO neutral territory. This series will be called "February 24, 303." This was the day which witnessed the largest and worst persecution of Catholics in Rome, called after Diocletian asked the Oracle of Apollo approval for such an empire-wide ruling against the Church. The Diocletianic Persecution was not the first in Rome. In fact, it was the last. From 303 until 313, in some part of the empire, Catholics were systematically rounded up and killed. What I want to do is to help readers understand what these ten years meant for those Catholics who had to endure such an organized slaughter. I want to explore both how Catholics maintained their lives, and even helped to spread the Gospel under duress, how they passed the Faith on to their children, and how some survived without compromise. These posts may help us all be prepared both spiritually and mentally for things to come. Compromise results in eternal death. Such persecution will be the fate of some reading this post today. 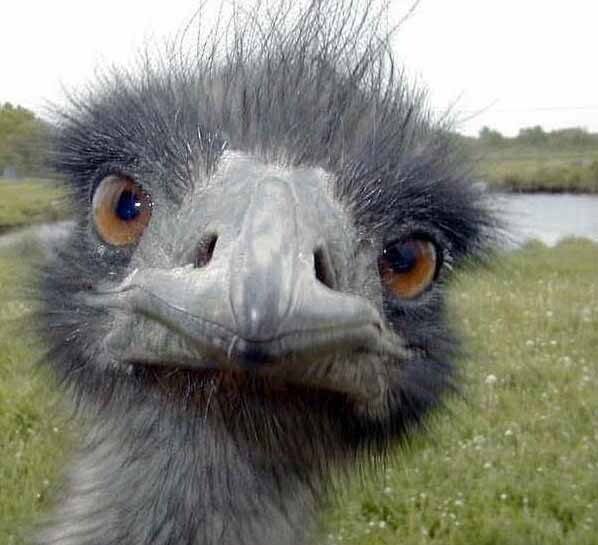 My favorite animals are birds. And, although I do not care whether my cats go to heaven, I would wonder whatever could take the place of birds, especially the morning chorus, which will not occur for several months. One reason out of several I decided I could not live in Malta year round was the lack of birds.That may sound like a drastic decision to some, but I love birds. But, now that I am in Ireland, I am happy to see and hear birds, even for the past six very cold weeks I have been here. Today is perhaps the coldest day we have experienced. It was colder here yesterday, in the built-up village north of Dublin where I am staying, than in Iowa! However, as cold as it is, the grass is green and the birds live in the hedges and conifers. 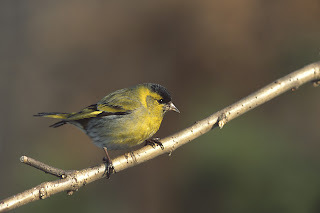 Beside the ubiquitous European Robin, the Hooded Crow, Ring-Necked Doves, European Starlings, Magpies, and Seagulls, today I saw a small flock of Eurasian Siskins in a set of dilapidated yew trees near my flat. I cannot tell you how exciting this is for me. I kept a bird diary for about 35 years, only stopping when I could not keep up with the entries. I have been a serious birder since my early twenties, keeping records, using good field glasses, tromping around soggy Minnesota, Wisconsin and other bird sanctuaries, including some in England. I can recognize many species by calls, as I trained myself by memorizing songs, first from tapes, and then from CDs. If one can hear, one can look in the appropriate place for the bird. In Missouri, my son and I saw hundreds of birds, including the Great Barn Owl, the Great Horned Owl, and Bald Eagles almost daily in the summer. In Iowa, we identified many types of birds, including the Peregrine Falcon, the Fan-Tailed Hawk, the New World Quail, and the hundreds listed here. The Wiki list looks like a neater version of my first bird diary. And I have seen most, if not all of those birds on that list. But, today, on Candlemas, and the coldest day I have experienced in Ireland, to see the little band of Eurasian Siskins is a gift from God. They are still fluttering in and out of the yews, moving quickly and nervously as they do, showing their yellow coloring and improving my cold morning with their bits of sunshine. Ah, the resident Magpie just claimed its space. The yellow birds have flown away. I think the little Eurasian Siskins are gone. 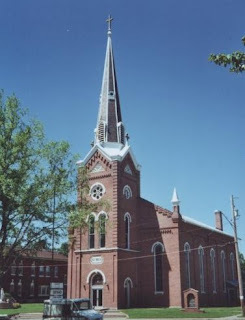 In my old parish in the Midwest, where I was baptized, made my First Confession and First Holy Communion and where I was Confirmed, the families would bring the candles to the Church for the blessing from the priest. These were candles used in the house for the prayer corner, or feast days. The children would bring their candles as well. I have not seen this happening anyplace else, but the custom is delightful. I think Catholics in Poland do this, and if other readers have brought candles to Church, they should make a comment. Especially when I was young, a home visit from the priest involved meeting the priest at the door with lit candles when he came to bring Holy Communion to the sick. Even in the early 2000s, when I belonged to an FSSP parish and I was ill, my son met the priest at the door with our blessed lit candles. Catholics should renew these good customs, as part of our Catholic identity. Candles at this time of year remind us of the Light of Christ, dispelling the darkness of sin and death. Candlemas for me is also a time for remembering a great day at Kingston Lacy. 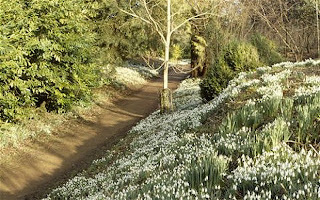 Near Wimborne in Dorset, my old county, the snowdrops begin to come out at this time of year, depending on the snow and cold. Recently, the latter part of February has been a good time to see the flowers, also known as Candlemas Bells. The flower pushing itself out of the snow seems a reminder that perseverance is a necessary virtue of the Christian. The temerity of these little blooms heralding in Spring gives us courage. My first visit revealed a vision of white cascading through the trees. I saw a few of the snowdrops at Buckfast Abbey last year, but I had missed the peak time. 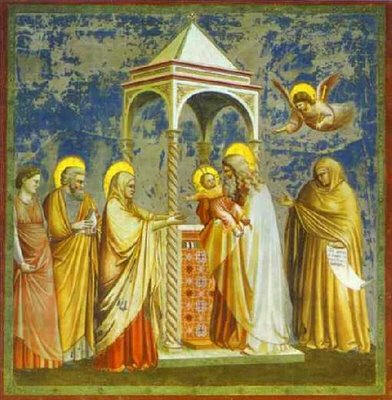 Candlemas, being the Feast of the Purification of Mary and the Presentation of Jesus in the Temple, should be a time of rejoicing. The snowdrop, being "my flower" for January in old English books, as my birthday is in January, will always be one of my favorites. I, too, bloom well in conditions less than perfect, and look forward to longer days and shorter nights. 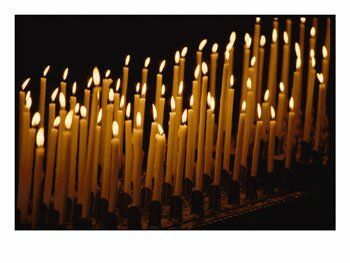 Candlemas moves us forward to Lent and Easter, as we look towards new life. Forty days after the birth of Christ Mary complied with this precept of the law, she redeemed her first-born from the temple(Numbers 18:15), and was purified by the prayer of Simeon the just, in the presence of Anna the prophetess (Luke 2:22 sqq.). 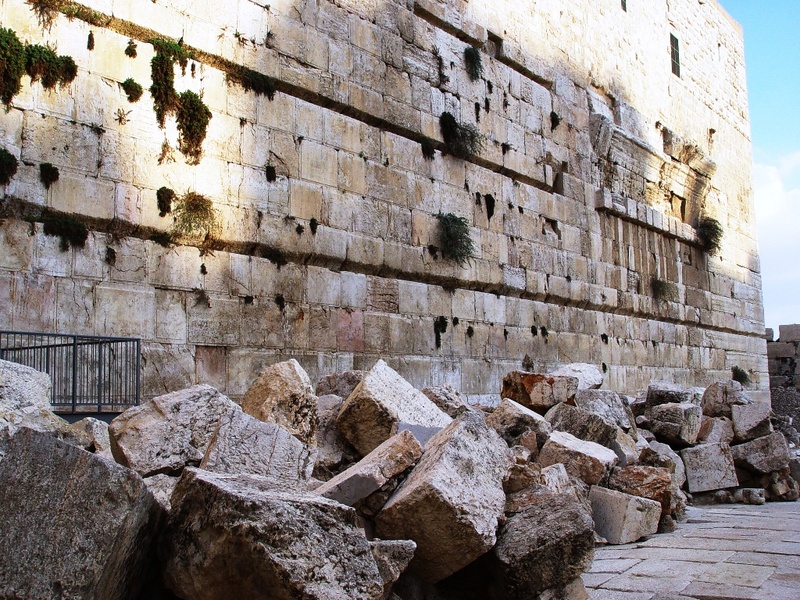 No doubt this event, the first solemn introduction of Christ into the house of God, was in the earliest times celebrated in theChurch of Jerusalem. We find it attested for the first half of the fourth century by the pilgrim of Bordeaux, Egeria or Silvia. The day (14 February) was solemnly kept by a procession to the Constantinian basilica of the Resurrection, a homily on Luke 2:22 sqq., and the Holy Sacrifice. But the feast then had no proper name; it was simply called the fortieth day after Epiphany. This latter circumstance proves that in Jerusalem Epiphany was then the feast of Christ's birth. From Jerusalem the feast of the fortieth day spread over the entire Church and later on was kept on the 2nd of February, since within the last twenty-five years of the fourth century the Roman feast of Christ's nativity (25 December) was introduced. InAntioch it is attested in 526 (Cedrenue); in the entire Eastern Empire it was introduced by the Emperor Justinian I (542) in thanksgiving for the cessation of the great pestilence which had depopulated the city of Constantinople. In the Greek Church it was called Hypapante tou Kyriou, the meeting (occursus) of the Lord and His mother with Simeon and Anna. The Armenians call it: "The Coming of the Son of God into the Temple" and still keep it on the 14th of February (Tondini di Quaracchi, Calendrier de la Nation Arménienne, 1906, 48); the Copts term it "presentation of the Lord in the Temple" (Nilles, Kal. man., II 571, 643). Perhaps the decree of Justinian gave occasion also to the Roman Church (to Gregory I?) to introduce this feast, but definite information is wanting on this point. The feast appears in the Gelasianum (manuscript tradition of the seventh century) under the new title of Purification of the Blessed Virgin Mary. The precession is not mentioned. Pope Sergius I (687-701) introduced aprocession for this day. The Gregorianum (tradition of the eighth century) does not speak of this procession, which fact provesthat the procession of Sergius was the ordinary "station", not the liturgical act of today. The feast was certainly not introduced by Pope Gelasius to suppress the excesses of the Lupercalia (Migne, Missale Gothicum, 691), and it spread slowly in the West; it is not found in the "Lectionary" of Silos (650) nor in the "Calendar" (731-741) of Sainte-Geneviève of Paris. In the East it was celebrated as a feast of the Lord; in the West as a feast of Mary; although the "Invitatorium" (Gaude et lætare, Jerusalem, occurrens Deo tuo), the antiphons and responsories remind us of its original conception as a feast of the Lord. The blessing of the candles did not enter into common use before the eleventh century; it has nothing in common with the procession of the Pupercalia. In the Latin Church this feast (Purificatio B.M.V.) is a double of the second class. In the Middle Ages it had an octave in the larger number of dioceses; also today the religious orders whose special object is the veneration of the Mother of God(Carmelites, Servites) and many dioceses (Loreto, the Province of Siena, etc.) celebrate the octave. According to the Roman Missal the celebrant after Terce, in stole and cope of purple colour, standing at the epistle side of thealtar, blesses the candles (which must be of beeswax). Having sung or recited the five orations prescribed, he sprinkles andincenses the candles. Then he distributes them to the clergy and laity, whilst the choir sings the canticle of Simeon, "Nunc dimittis". 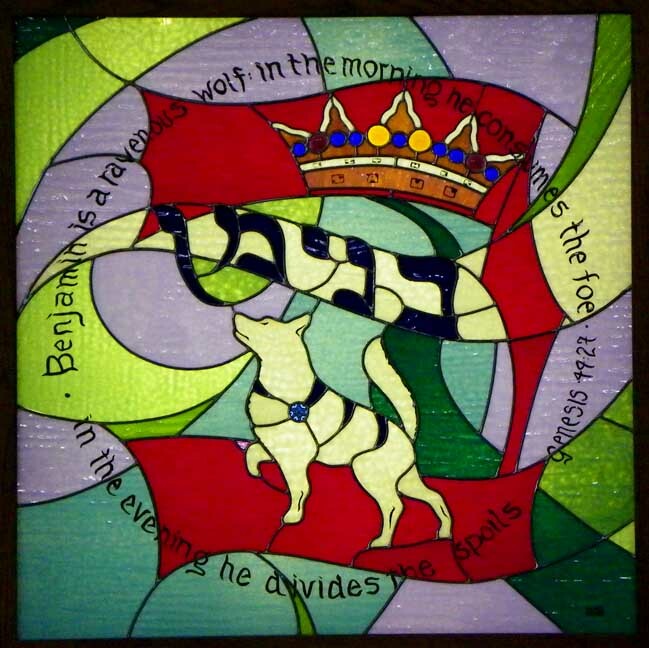 The antiphon "Lumen ad revelationem gentium et gloriam plebis tuæ Israel" is repeated after every verse, according to the medieval custom of singing the antiphons. During the procession which now follows, and at which all the partakers carry lighted candles in their hands, the choir sings the antiphon "Adorna thalamum tuum, Sion", composed by St. John of Damascus, one of the few pieces which, text and music, have been borrowed by the Roman Church from the Greeks. The other antiphonsare of Roman origin. The solemn procession represents the entry of Christ, who is the Light of the World, into the Temple of Jerusalem. 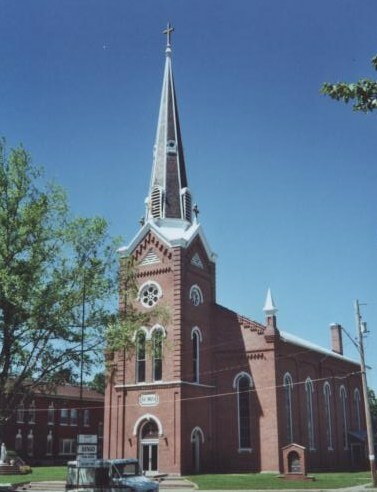 It forms an essential part of the liturgical services of the day, and must be held in every parochial church where the required ministers can be had. The procession is always kept on 2 February even when the office and Mass of the feast is transferred to 3 February. Before the reform of the Latin liturgy by St. Pius V (1568), in the churches north and west of the Alps this ceremony was more solemn. After the fifth oration a preface was sung. The "Adorna" was preceded by the antiphon "Ave Maria". While now the procession in held inside the church, during the Middle Ages the clergy left the church and visited thecemetery surrounding it. Upon the return of the procession a priest, carrying an image of the Holy Child, met it at the door and entered the church with the clergy, who sang the canticle of Zachary, "Benedictus Dominus Deus Israel". At the conclusion, entering the sanctuary, the choir sang the responsory, "Gaude Maria Virgo" or the prose, "Inviolata" or some other antiphon inhonour of the Blessed Virgin. The Power of the Blessed Sacrament needs to be found in silence. Father David Jones has many hard words to say to us, and especially the Irish. The priests have been warned about the tabernacle keys and they are to wear them on their persons. As he says at the end, face reality, not the false. There is a connection with lies and Candlemas in these days, sadly. But, for sure Candlemas is Catholic in origin. 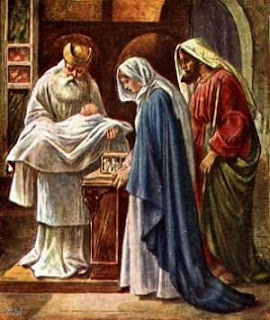 Candlemas is the great feast of the Presentation of Our Lord and the day when candles were blessed. It was in older days the last day of the Christmas Season, and the end of feasting. 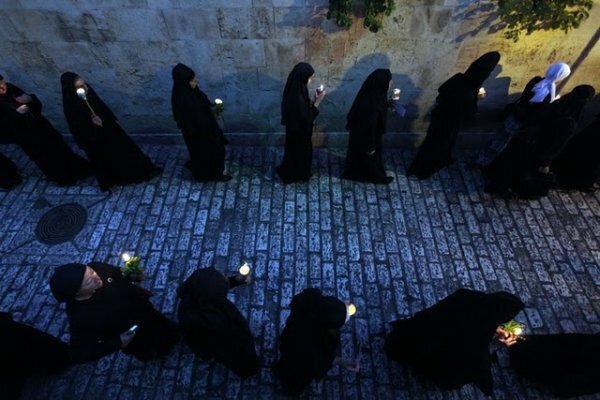 It also marked the beginning of the Long Fast in the monasteries. This is all based on common sense, as we all need to eat more in the coldest parts of the winter for health reasons. God based His Religion on nature and natural law. Be grateful for such a consistent religion as the Catholic Faith. 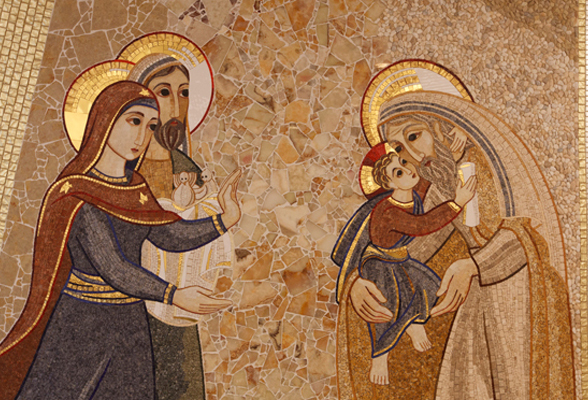 Mary and Joseph were obeying the Law and the Holy Spirit inspired Anna and Simeon to see the Messiah and prophecy the suffering of both Christ and Mary. So, already, we are looking towards Lent and Passion Week. It is a big day and should be marked with more ceremony, but no longer a holy day of obligation. Here is the Latin of the reading of that day. The Presentation is the sign to the Jews that Christ is the Messiah. It is also the sign of the fulfillment of the prophecies and Mary's role in Salvation History. And, that Christ is the Light of the Gentiles, the entire world. However, in these days of confusion and chaos, the wiccans have taken this day as one of their own. They are using revisionist history to convince youth to follow some ways which are supposedly older. We need to fast and pray for the souls of our children and we need to be authorities in our home against evil. These false wicca feasts are a great deceit perpetrated by the evil one to take youth away from the Catholic origins of this feast and others. I appeal to Dads. I appeal to seminarians. I appeal to priests. Go to Adoration. Make the promise if you can, especially Dads, to go before the Blessed Sacrament daily for an hour. Pray for our children to be protected for falsehood. Please consider this. Do not adore the television, Dads. Adore God. Today, I have been imagining the family of the Great Apostle Paul. He was from the Tribe of Benjamin, so they were Benjamites. He was a Roman citizen from birth, so they could have been wealthy, helping the Empire in some way. He was highly educated by the elite of his day, Gamaliel among others. So, he was special, chosen, extremely intelligent, gifted. He was of the ruling class in Jerusalem, a Pharisee. His family must have been the same, or similar--orthodox, keen, even zealous Jews, aware that they were of the Chosen People of God. Were his parents dead? Did he have siblings? Where did his siblings live? Was he an only child? Were his family members all dead when he became a Catholic? Where were they? Did they ever hear him preach? Did his mother worry about him on his travels? Did his father disown him? Was he an orphan? No one in my large family reads my blog. They do not want to hear anything I can say, and they do not want to accept what little things I can do for them. They are either liberal Catholics, or too old, or atheists, or agnostics. And, St. Paul was famous in his Catholic ministry, our First Theologian, not a little old Iowan sitting in the middle of nowhere. 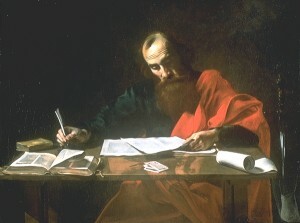 It is highly possible that St. Paul's family, either immediate or extended, never read his epistles, or heard him preach, or saw him make miracles in the Name of Jesus. When one of my ancestors who became a nun went into the convent, her father never spoke to her or of her again. 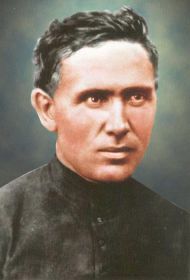 When St. Damien of Molokai told his father he wanted to be a priest, his father objected. The next morning, the father told Damien to get into the farm cart and the father drove him to the town to the priest's house. He never spoke with Damien again. I assume he never wrote. The price of discipleship can be complete separation of one from one's family. God chooses whom He will. None are worthy to be saved or called Catholic. None earn heaven, as Christ has done this for us. But, for some, for many, for me, this means isolation from those we naturally love the most. 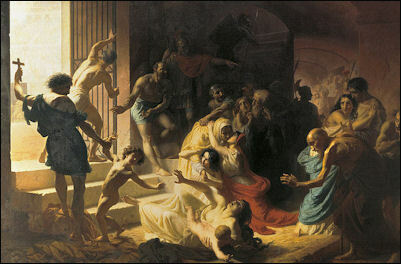 I wonder today about St. Paul's family. When he healed the father of Publius on Malta, did he think of his own father, his uncles, a brother? When he raised the young man from the dead, Eutychus who fell out of the window and died, did he think of a younger brother, or a son he never had? He did not even have a son following Christ, like I do, for comfort. But, I am the sister of St. Paul and you are his brothers and sisters. The family of God is made up of those who believe. A bittersweet call is the call of Christ out of our families into the world and the Church. It is time to value those in the family of God and make community. 47 And one said unto him: Behold thy mother and thy brethren stand without, seeking thee. 48 But he answering him that told him, said: Who is my mother, and who are my brethren? 49 And stretching forth his hand towards his disciples, he said: Behold my mother and my brethren. 50 For whosoever shall do the will of my Father, that is in heaven, he is my brother, and sister, and mother. It is possible to lose the call of discipleship by staying in a family which rejects God. God calls us out and we need to be open to those to whom He sends us. I know of one priest who finally left the priesthood because his family had always been against his call. I know of a young man who could not stand up to his parents and stay in the seminary. I also know a beautiful young nun, an only child, who left a completely secular family,and entered the cloister. I started my blog in 2007 for my student friends to continue discussions. In 2008, I tried to tell people about potus-I had lived in Illinois when he was senator and knew all the bad stuff. I have written on how to become holy using the wisest words of the Doctors of the Church and Garrigou-Lagrange. I have shared experiences and the need for purification, being in the Dark Night of the Soul, reaching out to my beloved readers, many of whom are now good friends and give me more than I give them. Ostriches have dotted this blog, as so many Catholics are still asleep. I have warned against false seers, false teachers, heresies, the occult. I have tried to teach the superb and beautiful truths of the one, holy, Catholic and apostolic Church. I have tried to help people fall in love with my Bridegroom, Jesus Christ, my First Love. It is time to act and stop pretending that things will stay the same in the near future. Things will not stay the same. And, in order to live up to my baptismal promises, I must preach and teach and pray for you all. But, time is short. I am not sure where to go from here. Pay attention. Preach the Good News, and if those around are not listening, dust the dust from your feet and move on. I ask those readers who pray the Chaplet of Divine Mercy daily to remember me in their prayers so that I persevere to the end. We live out our salvation in fear and trembling.